Maryam is an Iranian immigrant who has long lived in Britain with her British husband and a now-grown, pregnant daughter, Sara. When Maryam’s sister dies in Iran, her son comes to live with Maryam, dredging up a past that Maryam had long attempted to forget. After her actions set off a chain of events leading to the miscarriage of Sara’s baby, Maryam leaves for Iran to confront her past. The story is told from alternating perspectives – Maryam’s and Sara’s – and weaves present and past narratives together. This audiobook was a random find from the local library shelves in Massachusetts. I was preparing a collection for travel-listening, and then between traffic and rain and exhaustion, didn’t really end up listening to much on the trip to Texas! I’d been anticipating this one for awhile, though, and decided to set it going right after we settled into the new house. Now that I’m done, I’m in two minds about the book. On the one hand, it was fantastically presented. I didn’t want to put the book down, and found all sorts of ways to listen to it. When a book can get me to do extra chores around the house in order to listen, you know that speaks well for it! It was also a fantastic portrayal of Iranian culture. Realistic. Grim in places, yes, but not dismissive or disparaging of the culture in general (the way too many books about or set in the Middle East tend to be). There was a great contrast between loving a place that is home, even when that home and the things that happened there were horrible at times. There was also a fair amount of pre-revolution Iranian history. I loved the characters and found them all three dimensional and sympathetic. So why am I in two minds? Well, it’s certainly not anything specific about the book. Nothing ruined the experience. I finished it and loved it. Within a few days, however, the book almost entirely disappeared from my mind. Despite my extra chores and such, it still took nearly two weeks to listen to the book, so it wasn’t that I went through it too fast – the usual culprit when a book disappears from my brain. All I can think is that this book ended up suffering from what I think of as the Cellist of Sarajevo syndrome. I loved that book when I read it, and within a few months, I couldn’t remember anything from it. I really don’t know why. For some reason – something that could be specific to a book or to myself in a certain moment – some books just don’t stick. This is one of them. 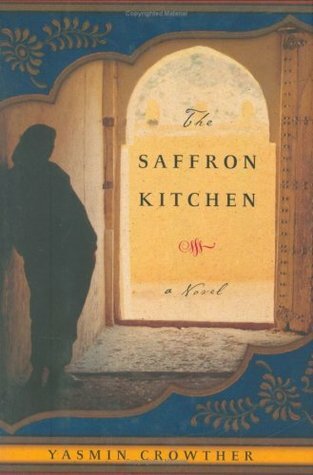 The thing is, I’d still want to encourage people to read The Saffron Kitchen, for all the reasons I named above. The audio performance, read by Ariana Fraval and Mehr Mansuri, was also fantastic. I don’t know why the book didn’t stick, and I suspect in this case that it probably has a whole lot to do with moving across the country and putting a house together and not being quite yet into a real routine. In other words, because of me, not the book. So if literary and cross-cultural fiction, with a little historical fiction and immigrant experience, is your kind of book, then this is definitely one to pick up. This entry was posted in 2015, Adult, Prose and tagged audio, gender studies, Middle East, POC, psychology. Bookmark the permalink. Many books that I loved didn’t stick with me, no matter if I carefully or quickly read it the first time. It’s a very strange event in my opinion, and yet it happens often. I don’t mind it so much since I’m a re-reader by nature. I do, however, hate hate hate it when a book I dislike sticks with me, like that damn Atonement. I only read a few chapters and hated it, but the small portion I read sticks in my brain like a butcher knife. I don’t tend to reread things that don’t stick with me, but the things I do (unless, like Atonement, they are ones I hate. Notably, Atonement DIDN’T stick with me, despite reading/skimming the whole thing). I think that’s one reason that my mind takes favorites and obsesses over them for weeks, making me multi-read them, haha!